Logan Pass (elevation 6,646 ft (2,026 m)) is located along the Continental Divide in Glacier National Park, in the U.S. state of Montana. It is the highest point on the Going-to-the-Sun Road. The pass is named after Major Willian R. Logan, the first superintendent of the park. Just east of the pass, an area known as Big Drift often records over 100 feet (30 m) of snowfall, much of which has been pushed over the continental divide by the prevailing westerly winds during the winter. The pass is closed during the winter due to avalanche hazards and the virtual impossibility of keeping the Going-to-the-Sun Road open, yet is generally open from mid-to-late June until mid October. The pass provides an excellent vantage point to view wildlife. A visitor is almost guaranteed to spot a mountain goat as they have become adjusted to summertime human visitation. ^ Devlin, Vince (2014-04-11). "Record 139 mph wind recorded at Logan Pass in Glacier Park". Missoulian. Retrieved 2014-04-17. Glacier National Park. "Logan Pass - July 20, 1999 around 8:00 pm". Retrieved 2006-05-08. TopoQuest. 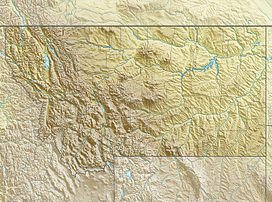 "USGS Logan Pass Quad". Retrieved 2008-06-30. This page was last edited on 22 March 2019, at 17:47 (UTC).